Entrepreneurship is hard. There’s no way around it. For one, it’s a lonely journey, packed to the punch with grueling work. It’s not the 9-5 job your parents had or that most of your peers went into. It’s the work that requires all hours of the day because of that constant nagging feeling that you could or should be doing more. Suddenly, it becomes harder and harder to keep your head above water. You may find yourself cancelling plans with friends or never making them to begin with because every working hour revolves around your business. And, when work / life balance is always coming out heavy on the work side, work begins to define your life. Then comes the other challenge of entrepreneurship: the fusing of your identity with the performance of your company. When things aren’t going well in your company, you may feel like you’re the only one to blame. Because your startup is your life, when things aren’t going well in the business, it makes it challenging to escape that stress when with friends, family, or during downtime. It makes it challenging to separate other tenets of your life from your startup. 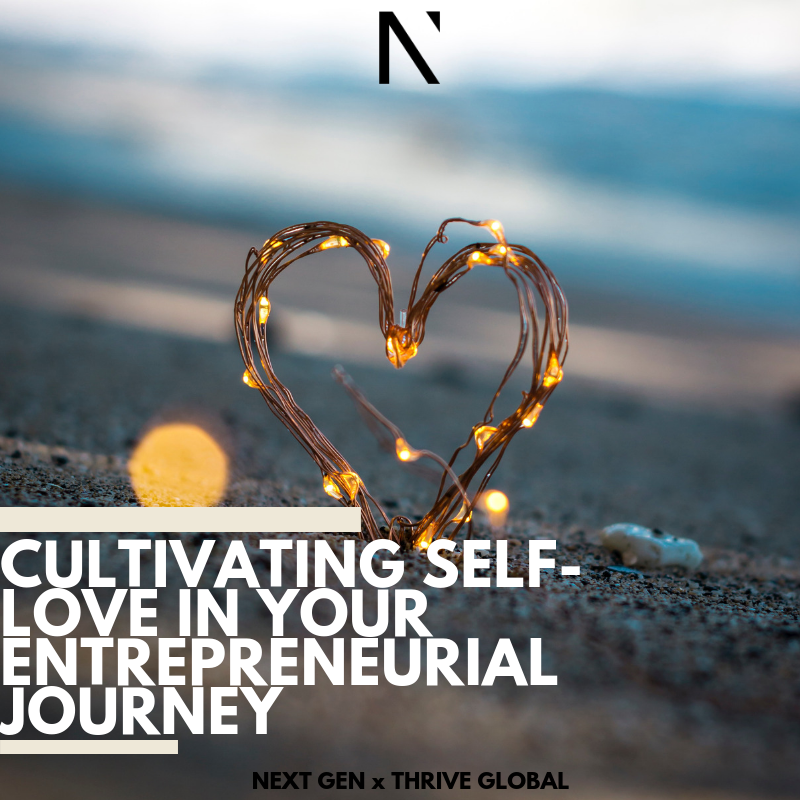 It makes it hard to love yourself, to be patient with yourself, and to practice self care, when you may wholeheartedly believe that the success of your business depends solely on the hours and hard work you put in. We asked members of the Next Gen community to weigh in on what they do to keep their head above water and practice self love in the face of incredible startup stress.Here’s some of their personal advice. Adrian France is the co-founder of the Odyssey, which she started when she was still in college at just 21 years old. It grew to a company with 100+ employees that raised $45 million in venture funding. Adrian knows startup stress. She worked the long hours in the back room of a bagel shop to get the Odyssey off the ground, and ran into the inevitable hiccups associated with starting a business and hiring the right people. Now, she’s a startup coach who helps other entrepreneurs achieve the same success that she did. Her best advice? To keep your weekends stress-free. “I prep for the next week on Fridays as much as I can for a stress free weekend to re-energize and kick Monday off right,” she shared. That way, when she gets back to the grind Monday morning, her to-do list is at zero and her mind is in the right headspace. And, you can’t argue with the sage advice to enjoy your weekends! Physical health looks different for different people, but the general consensus is: healthy exercise, a nutritious diet, and of course…. a solid night of sleep. This is Thrive Global, after all… and just as Arianna Huffington is firm in her conviction that sleep is what the body needs most to thrive, our community agrees. Chris Ball has run startups for years and he advised that the key to self-love is 7 – 8 hours of good sleep a night. “The science around sleep’s impact on wellbeing and productivity is clear,” he shared. The vision of the entrepreneur is someone who never sleeps, and this has somehow been romanticized. But rather than working longer hours, work smarter. Jillian Richardson runs a community newsletter called the Joylist, which updates NYC-based community-lovers on must-attend events. Her mission is to make NYC feel less lonely. She prioritizes physical health by establishing a positive relationship with her body, and surrounding herself with people who deal with stress differently. She recommends the book The Feminine Genius for women in particular to get in touch with their bodies and take care of themselves that way. The App Store on your phone possesses a smattering of apps to help with self love and self care. Satvik Sethi is a student at Binghamton University who runs a startup called Runaway, a peer to peer mental health app. His recommendations: “You could get access to counselors through BetterMynd, you could make new like-minded friends through the Buddy Project, and you could try mindfulness and meditation apps to help calm your mind.” Headspace is a great choice for meditation. Sometimes having those resources right in the palm of your hand makes it easiest to get help quickly if you’re having a particularly challenging day. You don’t even have to leave your bed to do so. Inevitably, there are going to be some really good days, too. Maybe you’ll land a spot in a pitch competition – maybe you’ll even win! Maybe you’ll get that email you’ve been wanting… or that unexpected one that may change the course of your startup or your life forever. There is good amongst the stress. Focus on it. Finding moments of joy and fun amongst a hectic lifestyle will slow things down and bring them into focus. You need those treats, that vital rest, and that self-care to approach your business tomorrow with fresh eyes. No matter how your journey looks now, remember the wise words of Next Gen member Jordan Thibodeau, who is on Merger and Acquisition team at Google, where he’s worked for seven years. This too shall pass. The stress will pass, so breathe through it. But, the good times will pass, too, so cherish them while they’re here. You’re worth the investment of your self-care and self-love. Want to join a community that will lift you up and offer sage advice for the good and bad times of your entrepreneurial journey? Join Next Gen here.